History will remember the first time a POTUS and a Japanese PM stood together in Hiroshima more than their empty words. As expected, Shinzo Abe delivered one of his trademark, crocodile-tearful, "History is harsh" speeches*, sparing us his usual fake excuses, because this time, he was not required to provide any. Today, Barack Obama chimed in by using similar smoke screens. And of course, without apologizing. Yes, 'we have a shared responsibility to look directly in the eye of history', but don't count on us for saying that nuking Hiroshima and Nagasaki was wrong, or that Imperial Japan committed war crimes that also need to be remembered. The choice of a G7 host city is a fantastic opportunity to push a political agenda, and Hiroshima was a finalist for Shinzo Abe, who wants everybody to remember Japan as a pure victim, and to forget that it committed atrocities under the fascist regime he has, along with fellow members of Nippon Kaigi, pledged to restore ("Imperial Japan v. Japan"). 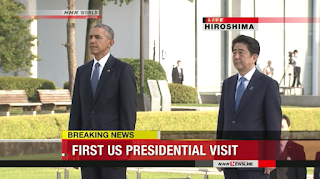 Sorry, Mr Abe, but "No, you can't honor A-Bomb victims in Hiroshima AND War Criminals in Yasukuni". Don't forget that as far as extremist lobbies go, Abe follows Shinto Seiji Renmei as well as Nippon Kaigi, and that as a fundamentalist, he wants the restoration of State Shinto, and of the Emperor as the supreme religious and political leader. A few Japanese voices raised objections regarding the choice of Ise, but who's listening to the dwindling resistance of the local democracy? * for last year's two masterpieces, see ""History is harsh" and other sick jokes" and "Decoding the Abe Statement: "why apologize for crimes Japan never committed?""